Lewis M. Branscomb (born August 17, 1926) is an American physicist, government policy advisor, and corporate research manager. 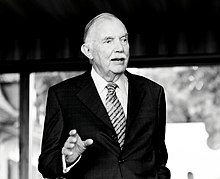 He is best known as former head of the National Bureau of Standards and, later, chief scientist of IBM; and as a prolific writer on science policy issues. Branscomb was a member of President Johnson's Science Advisory Committee (PSAC) from 1964 to 1968, during which time (a critical early period of the Apollo program) he chaired PSAC's Panel on Space Science and Technology. Under President Reagan, he was a member of the National Productivity Advisory Committee and was chair of the National Science Board (1980-1984). Other honors include president of the American Physical Society (1979), elected memberships in all three U.S. national academies (NAS, NAE, and IOM)(as well as the American Philosophical Society), and honorary degrees from 15 universities. In 1998, Branscomb was awarded the Okawa Prize "for outstanding contributions to the progress of informatics, scientific and technological policy and corporate management." He serves on the Advisory Board of the Journal of Science Policy & Governance. ^ a b Branscomb Family Foundation, Lewis Branscomb Professional Biography.